One month after we declared Oracle the DBMS of the Year 2015, relational DBMSs are again doing very well in our popularity ranking, although it's not Oracle this time. MySQL gained 21.87 scoring points in January, after being more or less stagnant for two years. PostgreSQL comes next, reaching an all-time popularity high in our ranking. 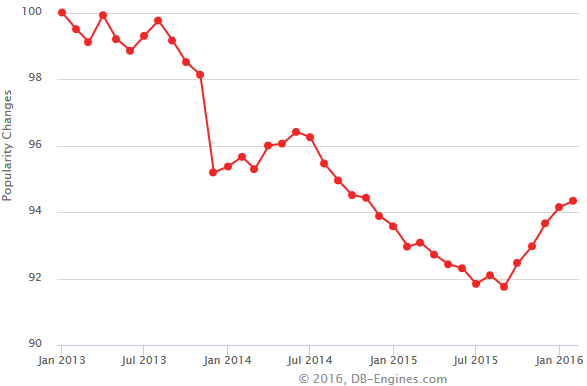 Microsoft SQL Server was pretty much on a downwards trend until last summer, but they somehow managed to reverse that trend since then. SQLite has established itself firmly in the top 10. MariaDB is the lowest ranking system amongst the big monthly winners at rank #23, continuing its steady growth in popularity we saw in the last 3 years. Although some RDBMSs, most notably Oracle, DB2 and SAP Adaptive Server are also amongst the biggest losers this month, there is a remarkable trend for relational systems to gain popularity in the last 6 months. If we look at the database model ranking, we see that non-relational systems such as Graph DBMS, Wide Column Stores and Document Stores are the long-term winners. However, zooming into the RDBMS chart shows a reverse short-term trend. There couldn't be anything better for the data processing community as a whole than a fierce competition amongst a variety of systems. That's what we see at the moment.